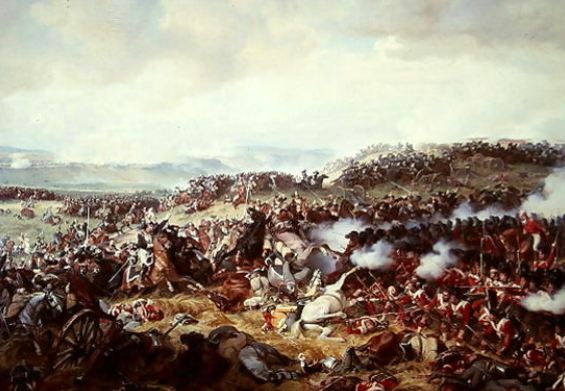 If you don't know much about the battle of Waterloo, I will try to tell you some more in simple words. I will not try to go in details because about the battle you can find so many detailed stories on internet. 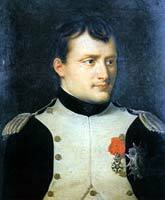 After his exile on the isle of Elba, that lasted about one year, Napoleon came back to France with a thousand men. The allied had admitted him to bring them with him to the isle. The isle had been for a year a small kingdom for him. 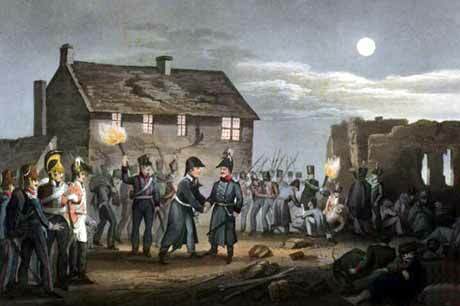 However the French king had gave the order to arrest him, the soldiers deserted an mass to their former emperor. Back in France Napoleon tried to make contact with his neighbor countries to convince them of his peaceful meanings, but the never answered him. The plan of the surrounding countries was to bring together a force of 100.000 men for each country and to attack France once and for all. 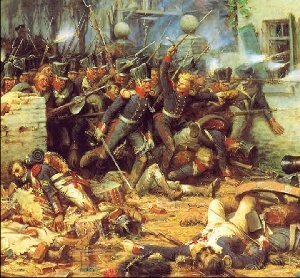 What they had not expected, was the fact that Napoleon would invade Belgium so soon. Before they new he was already on his way to Brussels. 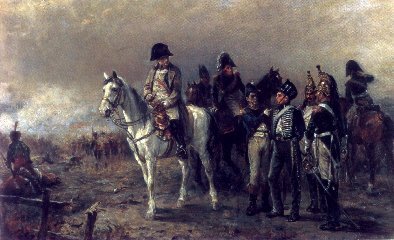 Napoleons main purpose was to divide the Prussian and British armed forces and to beat them separately. In first instance he succeeded. 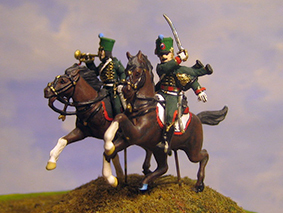 The Prussians seemed to run back to Germany. 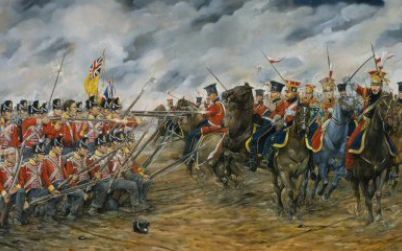 The next day, at Waterloo however, the Prussians came back, in the afternoon, just at the time that the Allied forces where loosing the battle. 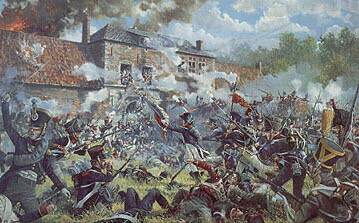 The British and Prussians where surprised by the velocity of the French forces. 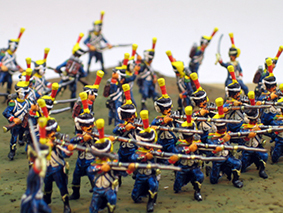 After a few day's of fighting the French marched up towards Brussels. Massive French formations on the march till late in the evening. It rained the whole day and night before the battle . It was nearly impossible for the troops to find rest, food and a shelter above their heads. Most of the men and horses where completely soaked the next day. with nothing to eat and hardly to drink. 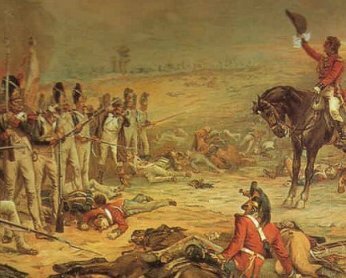 Lots of men would be drunk at the time the battle started. Their was no lack of brandy for most of them.. 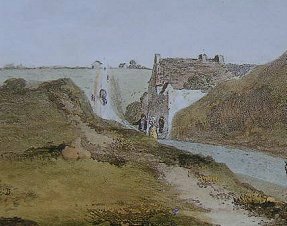 The road from Brussels with on the right side La Haye Sainte. If you imagine that you are standing with on the road, than Brussels is behind you back. 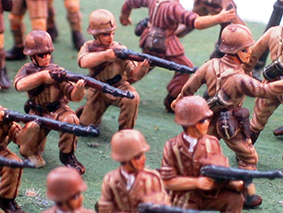 A the left there was during the battle a sandpit. The morning of the 18th. 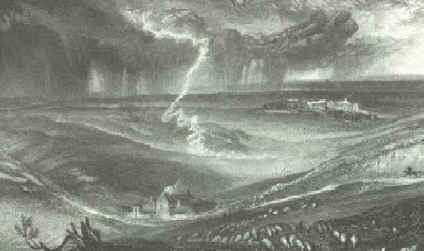 June 1815, Sunday morning. 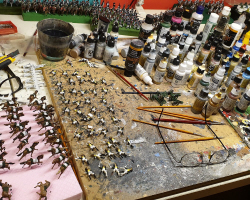 The Scots Greys, the glorious British cavalry wakes up. Tired, cold and hungry. No breakfast, no dry clothes. 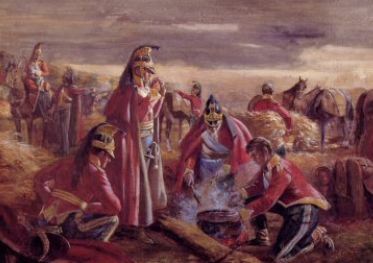 There are stories being tolled about British troops who received liquor for breakfast. 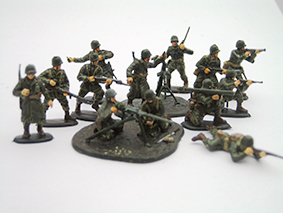 The Imperial Guard after the night. 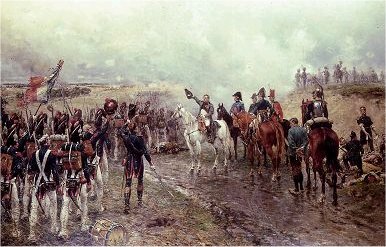 Napoleon gave started the battle at about 11.30. 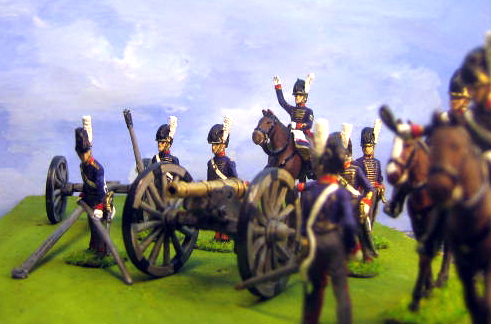 He waited so long because the ground was to wet for his cannons and horses. 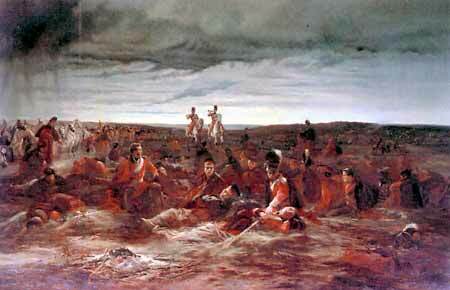 Waiting longer was a problem, because he was afraid that Wellingtons troops would use the evening darkness to flee. 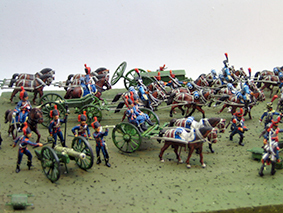 Red are Allied troops, blue French. In the middle La Haye Sainte, on the left Hougoumont. French forces start a massive attack on the center to try to divide the Allies. 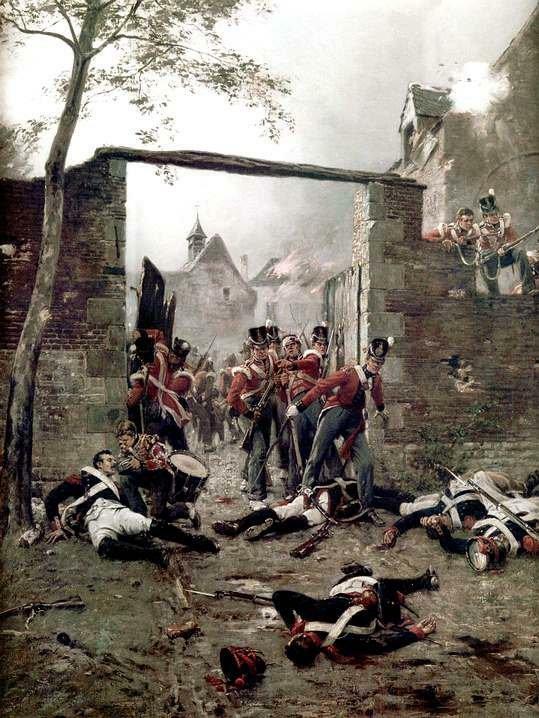 Meanwhile Jerome Bonaparte launches an attack on Hougoumont. What this picture is not showing is that most of the farm land were corn fields. The corn was standing on most places more than 2 meters high. 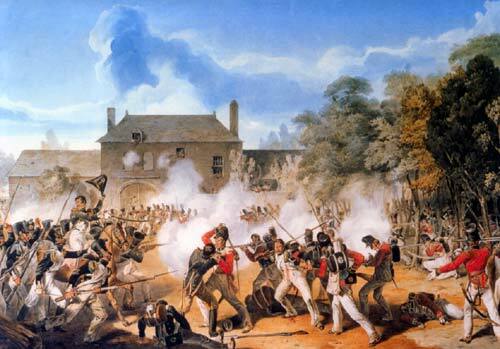 Immediately after the attack on Hougoumont, Napoleon gives the order to Derlon to attack the allied forces in the middle and to capture La Haye Sainte. 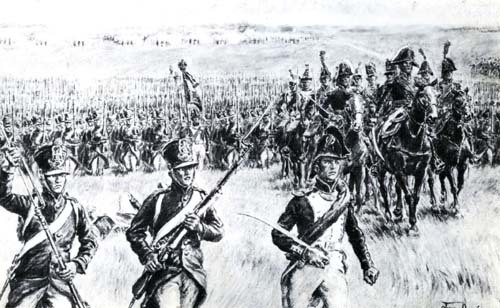 Thousands of French infantry men begin the march down into the valley after a barrage of heavy fire from the French guns. 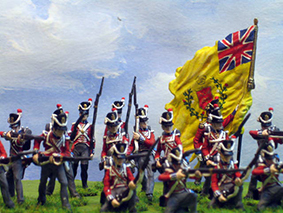 The British commander Wellington encourages his troops. 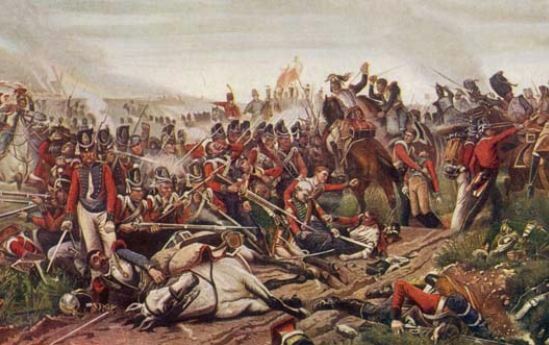 The sight of seeing the French entering the hills must have been a tremendous and dreadful view for the British. 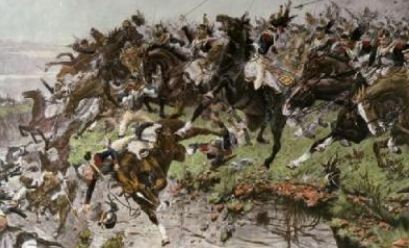 The battle for La Haye Sainte. 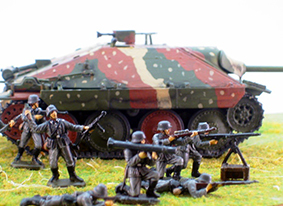 Huge fighting start when the French reach the orchard of the farm. 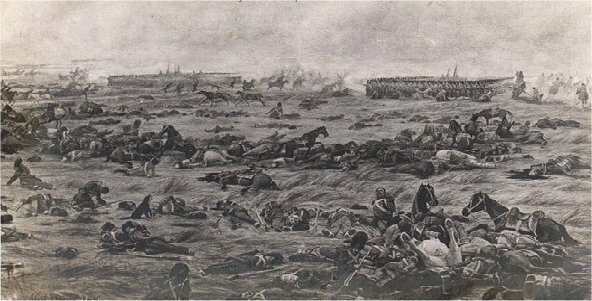 The 400 men who defend the farm will succeed until the beginning of the evening to keep the French out of the farmyard. At last they will flee because of a lack of ammunition. 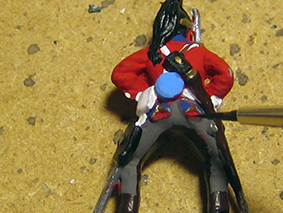 As an answer on the big French infantry attack, Wellington sends in his cavalry. 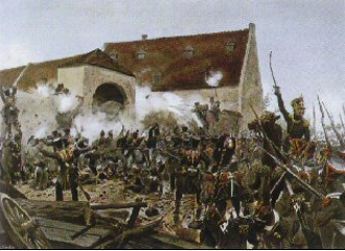 The French troops are forced to pull back with heavy losses. 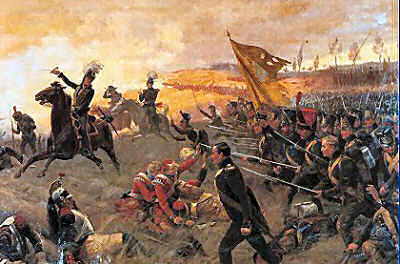 The British however, in their lust for more, attack the French guns and are nearly destroyed by a counter attack of the French lancers. 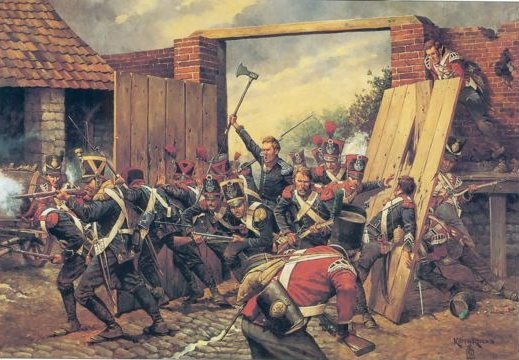 Several times the French tried to enforce the great gate of the farmyard, but never succeed. In the orchard, the French were more succesfull. On the background you see the thick smoke coming from the farm. 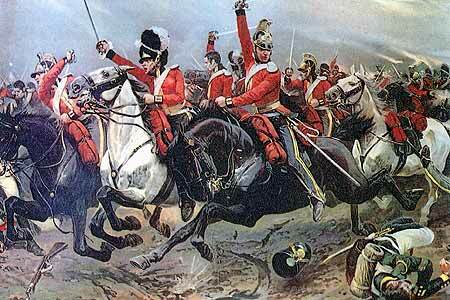 Meanwhile French Cuirassiers charge British infantrymen. On this picture you see the corn crowing high. 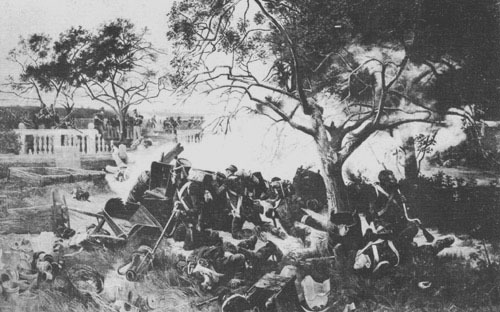 At the time of the battle the grain was sometimes about two meters high so that infantrymen nearly disappeared. So they did, again and again, wave after wave.The allied troops where glad with this distraction because now the French guns stopped firing at them. 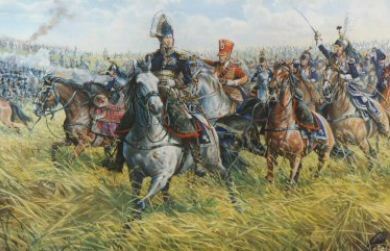 The French Marshall Ney decides that this is the moment to force a victory in the battle and leads his complete cavalry into battle. 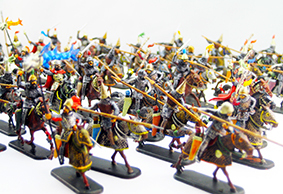 Massive formations of Cavalry were send to battle. Thousands of them were going on and on up the hill, till they were exhausted. 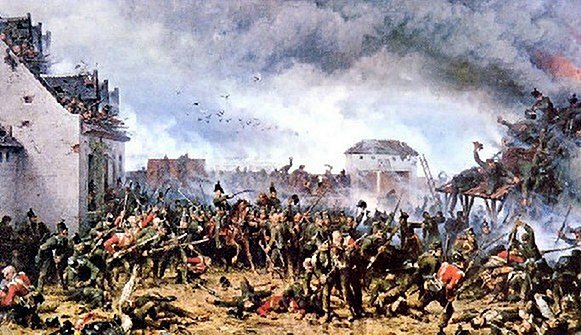 The French were not at all succesfull in their attack. The hollow road to Ohain. 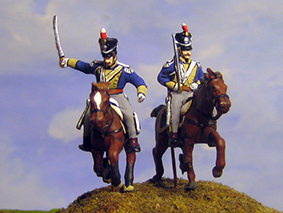 Dutch Dragoons where also involved in the battle.The Dutch/ Belgium part in the battle was a big one. 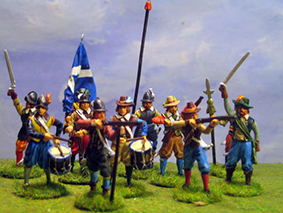 Problem in the battlefield was that many Dutch troops where still dressed in blue uniforms like the French. 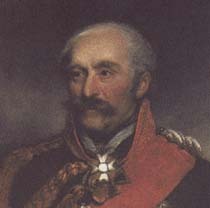 Napoleon had spotted the first troops of the Prussians, east of the battlefield. It was now a question of time. 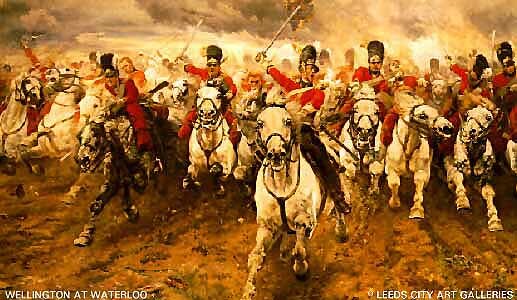 First the British and than the Prussians. 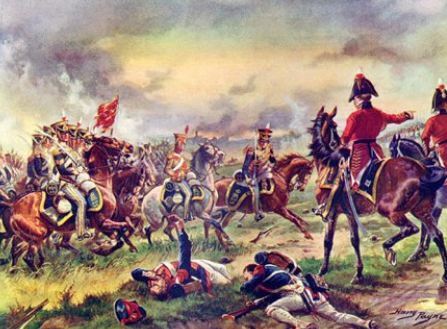 To force a breakthrough Napoleon decides to put his Old Guard into battle. 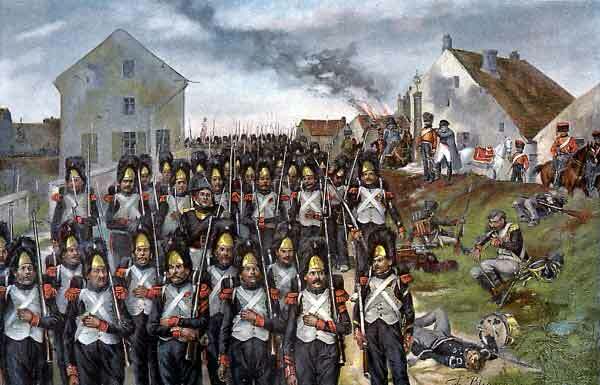 Prussian troops have already reached the outskirts of the village Plancenoit. 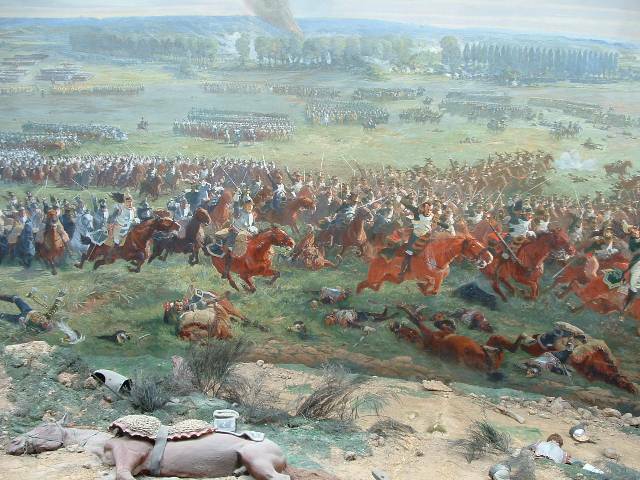 Heavy fighting bring lots of loses to the Prussians. But there are more and more coming.. 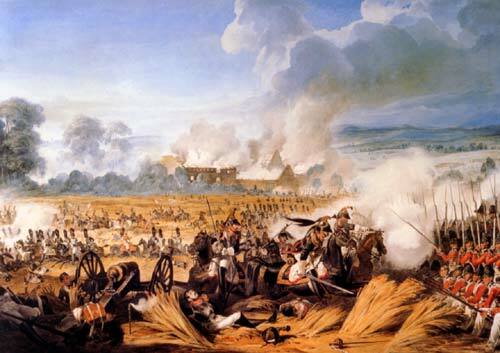 Although the French have been beaten, they will not surrender. 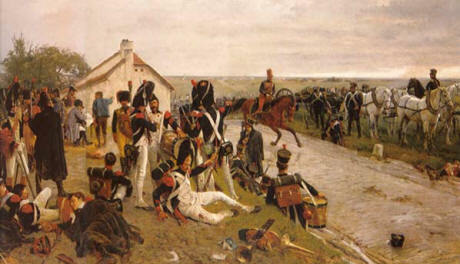 The story is told that he last French commander said the words that the Old Guard will never surrender. This painting can be viewed in the Rijks Museum in Amsterdam. 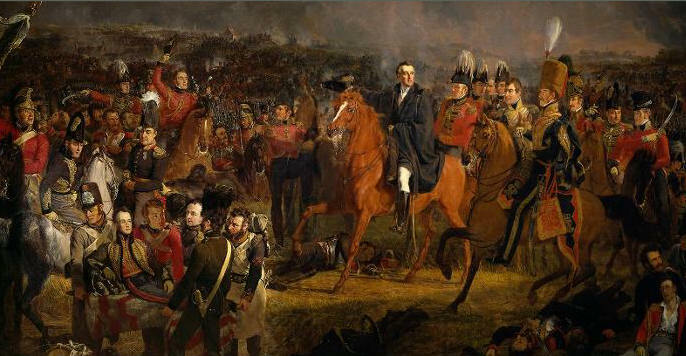 It shows, Wellington in center, Lord Uxbridge with brown shako and the wounded Prince of Orange on the left. 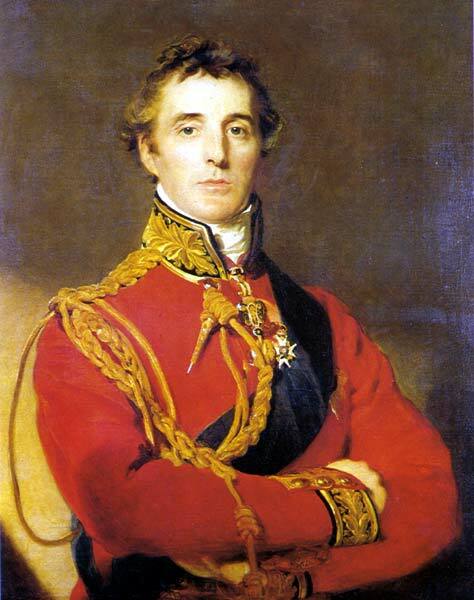 Even Lord Wellington shed tears about the incredible loss of lives from soldiers and good friends. 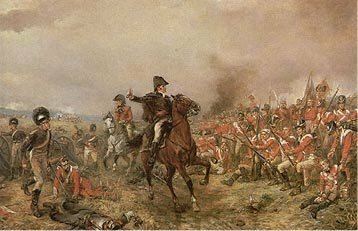 There has never been a complete record of how many casualties were left on the battlefield after this day. Some speak about 50.000 dead, disappeared and injured men. 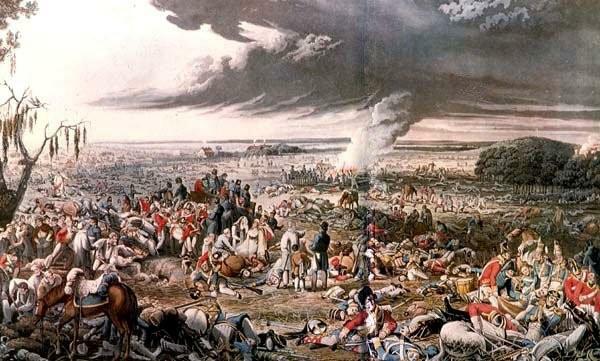 Fact is that there has never been a battle in history were so many people fought on a few square km's. There are a lot of people that admire Napoleon, but a fact is that this man has been one of the greatest butchers in history. What if this man had stayed on his island of Elba....?